Probably a whole lot of the same thing, consistent cash generation. If you are invested in Magellan Midstream Partners (NYSE:MMP), chances are you are scratching your head as to why shares have plunged more than 15% this year. Sure, Magellan is in the oil and gas business, but its primary role as a transporter of refined petroleum products at fixed fees is mostly isolated from the ups and downs of commodity prices. So what gives? Is there something going very wrong at the company lately? Or is the market just overreacting? 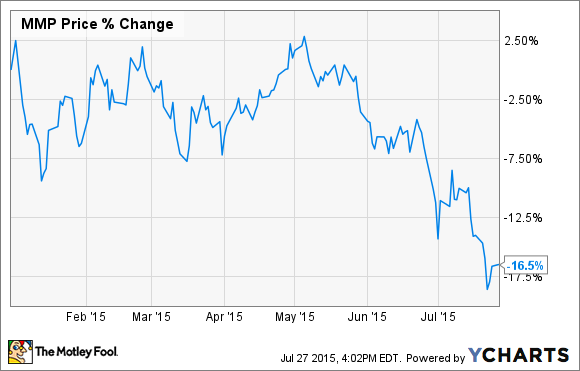 The best way to find out is when Magellan reports earnings on August 6. Here's a quick look back at what has happened so far this year and what you should expect. Last quarter's numbers were right where management had said they would be, but Wall Street had slightly better expectations. Last quarter's EBITDA came in at $285 million, which was $10 million short of analyst predictions. Magellan wasn't able to meet expecations last quarter mostly because of some commodity price weakness in the parts of the business that are exposed to prices. However, ramped-up volumes in its two crude oil pipelines in Texas helped to offset some of those refined product losses, as seen in this chart. Source: Magellan Midstream Partners earnings release, author's chart. While the slight decline in operating margins isn't the most encouraging sign, not all was bad news. Total distributable cash available to shareholders came in at $233 million, giving the company a distribution coverage ratio of 1.4 times. Also, management upped its distributable cash guidance for the remainder of 2015 based on some of the price protections it put in place last quarter for the rest of the year. According to Magellan's guidance for the entire year, management expects to generate about $870 million in distributable cash. Based on the first quarter's results, that means expectations for the rest of the year should be a little lower on average. This is pretty on par with what Wall Street expects as well. According to consensus estimates compiled by S&P Capital IQ, Magellan's EBITDA is expected to decline 13% compared to last quarter. Again, this doesn't sound great, but keep in mind that these estimates are actually better than originally forecasted at the beginning of the year. Also, the new amount of distributable cash flow the company expects to generate in the year will more than adequately pay its distribution, which it plans to increase 15% this year alone. With an expected distributable coverage ratio of 1.4 times for the year, it will also have a decent amount of cash that it can use to spend on its new projects. That will be critical because it has some pretty big spending items such as the Saddlehorn pipeline and its new condensate splitter in Corpus Christi, Texas, both of which are expected to be up and running in 2016. Based on the company's assumptions of better-than-expected distributable cash flow, a relative isolation from the worst effects of the oil price crash and a suite of new projects that will significantly boost operating margins, it's hard to know exactly why investors seem to be shying away from shares of Magellan Midstream Partners. But, hey, perhaps that is all the better for those who have Magellan on their radars as a potential investment. With Magellan's distribution yield hitting 4.3% -- its highest level since 2012 -- and the possibility that distribution payments will continue to increase in the coming quarters, now may be a great time to consider buying shares. Unless there are some unforeseen surprises coming in this quarter's earnings release, there aren't many reasons to say no.